Lace up your hiking boots, saddle up and get ready to shift gears! 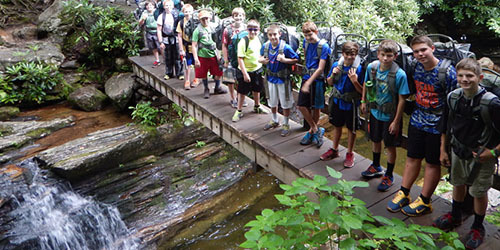 Trailblazer takes our all boys group into the forest with a backpacking trip in the scenic Pisgah National Forest. Campers will then rock climb over 75' and mountainbike to a local waterfall. If that’s not enough, the week will culminate a trip to Worley's Cave in TN! Check out the Info Sheet for packing list, physical requirements and camp descriptions. Check your schedule on our Dates and Rates sheet.